PVC Pipe Primer | Purple & Clear PVC Primer | FlexPVC® Browse these PVC pipe primers from Uni-Weld and Spears. PVC Pipe/Fitting Primer-Cleaner. We sell both the clear (to be used for projects not requiring a plumbing inspection) and purple (for use on projects that require a plumbing inspection.) primer/cleaner. There is no difference in the primer-cleaner. The building inspectors just want to see you used primer on your joints so they put a purple die in it so its easy to identify. Explore our selection of purple and clear PVC primer today. 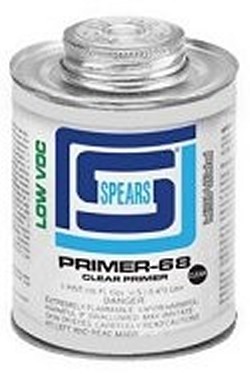 The clear primer/cleaner (in combination with clear pvc glue is great for hobby projects where you care about how the finished project looks.